Kuwait Cricket’s National U 19 team returned home after their best ever performance in the ICC U 19 CWC Asia Qualifier Division 2, 2017, hosted by Malaysian Cricket Association for the Asia region. Kuwait won all league matches and semi-final and finished in a respectable 2nd Place. I caught up with one of the top players and captain, Nomaan Sidiq Budroo and talked to him of his cricketing skills, about the tournament at large and his future plans. Karthik (YR): When did you start playing cricket? Nomaan: I started playing cricket from Class 2 and was inspired by my elder brother who is also a very good player. My parents always encouraged us to give our best on the field and did not pressure too much on our studies. Karthik (YR): Did you play any tournaments at school, club level earlier? Nomaan: I am playing cricket for my school DPS, Ahmadi from a long time and we were the winners of the Nelson Mandela trophy in the Year 2012. DPS has a formidable team and performed very well for the last few years. Our coach Joshi Sir has been very keen to develop good cricketers and I have benefitted a lot under him. I also play club cricket in seniors’ team called the TACK tournament and I won many trophies for my performance in the past tournaments. I also played last year in U19 Asian Cricket Championship (ACC). 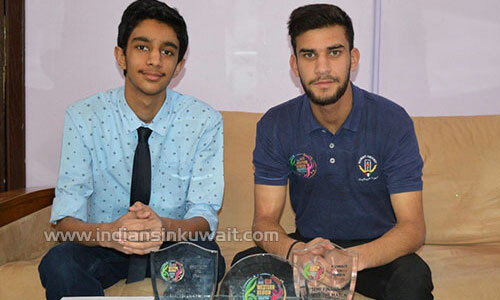 Karthik (YR):- It was commendable for Kuwait U-19 Team to win all their three league matches with Maldives, Qatar & Iran quite convincingly and top the Table standings in Group B. Tell me about the main strengths of the team and how did you manage to motivate them at every stage? Nomaan:- We practiced for about 6 months in Kuwait i.e., 40 matches before the tournament started. Bowling was our main strength. And as far as motivation is concerned, I kept reminding the players about their roles & responsibilities, what to do in each match at the league stage and also in the knockout stage when we qualified for semi-finals and finals. Karthik (YR):-How did your players cope with the pitch conditions in Malaysia? And what was your diet plan? Nomaan: -The tournament was scheduled to be played here, in Kuwait. But one week before it was to be started, it was relocated to Malaysia. And the pitches in Malaysia are faster, way faster than the ones in Kuwait. But out of the 11 in our team, 8 of us have already played in Malaysia before, and this being my third time, it wasn’t that tough to adjust to the pitch conditions. For food, we obviously couldn’t get home made food. We had to sometimes eat junk food. But we ate in a balanced manner, so that it doesn’t disturb our training regime. Karthik (YR):- Tell me about some challenging situations and how it was overcome? Nomaan:-One of the biggest challenges was when the venue was changed in the last moment to Malaysia. It was heartbreaking but then we had to adjust to the Malaysian conditions especially the humid climate and we had to increase our fitness levels, but as a team we stayed as one and when we all are together, it is easier to overcome any situation. Karthik (YR): - Defeating Oman in the Semi-final (Knock-out game) was top class. Your thoughts? Nomaan: - Yes, that is because until the semis, we didn’t get any challenging match as the three tough teams (Oman, UAE & Bahrain) were in the other group. In that match there was a rain in between when they needed 60 runs to win and had 6 wickets in hand. We had already dropped 8 catches and gave them a target of 150. Anyways, Oman’s batting squad was not in great form and bowling was our main strength. We thought the rain wouldn’t stop. But as the rain stopped, we felt it was our turn and our mental strength led us the way. Karthik (YR): -As the captain of the team, would you highlight the top performance of players you can be proud of? Nomaan:-Our vice-captain Abdul Haseeb performed very ell and took 15 wickets in the tournament. In the first match itself, he took 4 wickets. Also, another bowler Akhil Sujeev gave good performances. Karthik (YR): -How good is your coaching staff, other support staff and Kuwait cricket body in general? Nomaan: -The coaching staff changed this year. Last year we had a different coaching and supporting team. I feel it has become better. It has raised its standards this time and they ensured we had more practice matches than last year. This year, as mentioned earlier, we practiced for about 6 months playing 40+ matches here in Kuwait on turf and not on concrete pitches like last year. Also, we had fruitful practice sessions with the senior Kuwait team. Karthik (YR): - This is the 3rd time you’re representing Kuwait. What were the major differences you felt? Nomaan: - The first time when I played, I was young. As I didn’t have the experience to win, just going there, representing a country was a great thing. That was enough at that point of time. And as time kept going, we built the hunger to win. This time, our preparations were more focused. But it was different for us this time and we’ll definitely strive to do better next year. Karthik (YR): - What changes are you planning to do next year? Nomaan: -According to me, two changes must be made. Firstly, we need to take the practice sessions more seriously to groom the players and bestow confidence to back their skills. And secondly, we need to boost our mental strength. As some of the players in the team are just 14 and 15 years old, they lose hope easily and give up. If they get mentally stronger, we can make more difference and win next year. Karthik (YR): - After performing very well right thru’ the tournament and winning all matches, what happened in the FINALS against UAE? The margin of defeat was disappointing. Was choosing to field after winning the toss backfired? What went wrong? Nomaan:-I think, it’s not a mistake but back in our minds we had a feeling that bowling was stronger. So when we won the toss, we choose to bowl as we desired to finished the first innings speedily and then chase a small target. But then, it didn’t work the way we planned as we dropped 3 catches in the beginning. And then, they played exceptionally well by scoring 275 and we couldn’t face it. And on top of that, we had the FINAL PRESSURE too! We’ve never played a final before and UAE has been used to playing it. Plus, we had the semi-final only the day before. All this added up to the result! Karthik (YR): - Last year, you were the wicket-keeper, bowler and batsmen of the team. But this year, it has been changed. Why? Nomaan:- That is because, this year I was given the captaincy. So, my coach told me to leave wicket-keeping because I can’t keep concentrating on both. So now, I’m the captain and the batsman. But, I’ve bowled also in this tournament and got about 6 wickets. Karthik (YR): Where do you see yourself and Kuwait Team in five years’ time? Nomaan: Based on wherever I pursue my future studies, I would like to represent my University and hopefully play first class cricket within the next five years. Kuwait Team has the potential to get stronger and give consistent performances in top tournaments. We were very close to qualify for Asia Cup and hopefully can make it in a year or two. More young boys are coming forward to play cricket and are showing keen interest. It is a great feeling to see a team like Afghanistan defeat major sub-continent teams and win the Asia cup. They are scheduled to play the Under-19 World Cup starting on 13th January 2018 in New Zealand. Karthik (YR): - On a concluding note, would you like to share your final views? Nomaan:- I Would like to take this opportunity to thank everyone who was involved behind the team’s success. Apart from the delegation that travelled to Malaysia, there were thousands supporting from back home and a huge thanks to each and everyone. The team will surely achieve greater heights with the great support and facilities from Kuwait cricket. It has been a pleasure playing for the country and we all look forward to getting the Winners’ cup home next time! Karthik (YR): - Thank you for thanking us! And from IIK, we wish you all the best for your future events and a great success to the Kuwait U19 Cricket team! Congratulations Nomaan! May Allah bless you to conquer greater heights!! Also Karthik, good report, Keep it up! Congratulations Kuwait Under 19 team. Superb interview Karthik. Continue to be regular in reporting interesting articles. All the best. Good progress by Kuwait u-19 cricket team. Wish you more success. Also, kudos to IIK for providing good platform to Young Reporters. Superb interview Karthik. Continue to be regular in reporting interesting articles. All the best!!! Hearty congrats to Kuwait Team and wish they bring home big trophies in future. Kuwait Team rocks. Keep up the good work boys. Nomaan, wish you all the best for the future. Young Reporter, Karthik doing a great job!!! Kudos to nomaan and vice captain mr.hasseb for excellent parformence. All the best to Kuwait Team in future tournaments. Wish Nomaan Budroo will have a bright future. Very nice of IIK to present such articles and encourage Young Reporters. Good job Karthik. Hope to see Nomaan and his team mates in India cricket team in the future. Best wishes to Nomaan and his team. Nice article by karthik. All the best. Congrats Nomaan for your outstanding contribution last 3 years to Kuwait. Very good performance by Kuwait U-19 boys this year, wish them to continue rapid strides and qualify for Asia cup. A complete interview by Karthik to cover the entire tournament. Nice interview, Keep it up! !